I believe our secret to connecting with people is to promote conversations – giving people real life role models they can connect with, learn from and draw their own conclusions. The topic of men through pregnancy and birth is genuinely taboo, which causes all sorts of difficulties. We allow our guys to be honest, emotional and real – and it has terrific impact as a result. 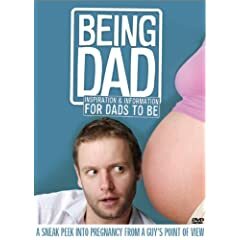 Being Dad is a genuinely unique film because we hear the fears, the joy, the perspective of the guys – and in watching it, women get us much out of it as men do, which is a real buzz. I think it starts during pregnancy. A guy that is connected, interested, supportive, and concerned has proven health benefits for mother and baby. It’s so hard for a guy not to be in active denial during the first pregnancy, which means reading is unlikely, talking to friends about it is very unlikely – and talking to the professionals is extremely unlikely. I think a film like ours allows the guy and his partner to sit down, hear some stories, have a few laughs and open up a really important line of communication. It also means that during the birth, the guy will have some idea whats going on, by being better informed, better prepared, and hopefully a better dad. I really believe it all starts with a little inspiration, which relies on some good communication. Get involved early. Being Dad: Bringing the Baby Home was a real eye opener for me. We followed 6 families as they brought the baby home – and even the most brilliant guys were so totally unprepared for what to do as they came into the house. I think the trick is that the wife was only half a step in front. My advice for the first time guys is to get some time alone with the baby. It allows mom some time to herself, to go and get a coffee with some friends – and it allows the dad a chance to roll up his sleeves, get his hands dirty (OK, bad analogy), make some mistakes like putting the diaper on backwards while not under the watchful eye of the mom. It struck me so much that I’ve taken a day off work every week since my daughter was born, and I think I’m a much more competent dad, with a much stronger bond with my little girl. I think there are two big ones – Waiting for the next stage of the kid’s development until they get involved and getting the work life balance wrong. I could imagine that would be one hell of a regret, but I think its a two way street. Talk to any of the “Being Dad” dads and they’ll regret they didn’t get to spend enough time with their dad as well. An easy way to fix that, get involved early and hang in there. I think they need to feel confident, be able to think for themselves, and believe they can achieve anything they want to. I’m a big believer in promoting an interest in learning and have them interested in solving problems. In that way, tough times are just part of the landscape – something to work through. I think it’s important for them to know that they have the ability to really hurt people, and that’s a bad thing. To a certain degree – smothering with love is a good thing, but not too much. Discipline (but definitely NOT in a physical punishment sense) plays a big part. But I think the most effective method is to have a close relationship with your child, support them and believe in them. Finally, I really hope that she can come to me with her problems as she really gets older, so I can be there for her through the inevitable challenges.